On Oct. 20, ElliptiGO hosted the 9th annual Elliptical Cycling World Championships, which took athletes up Palomar Mountain in North San Diego County. See the official results! 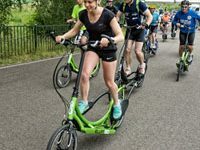 ElliptiGO Inc., the pioneer and world leader in stand up cycling, welcomed customers from around the world for the ninth annual ElliptiGO Rally Weekend. Rally Weekend is a chance for us to see you in person, hear your stories and share in the undeniable energy that every ElliptiGO rider shares. Here are some of the highlights from another successful gathering in our hometown of Solana Beach. Curious what it’s like to roll with us? Here’s a recap of the most anticipated event of the year: ElliptiGO Rally Weekend. You’ll hear amazing stories and see the smiling faces of the people who make being a member of the ElliptiGO community so special. It's that time of year again. ElliptiGO Rally Weekend is just around the corner and the Global ElliptiGO Riders Club is ready to receive your RSVP. Mary Johnson, Head Coach and Founder of Lift Run Perform, shares her thoughts on racing the Elliptical Cycling World Championships. ElliptiGO enthusiasts from far and wide gathered at ElliptiGO Headquarters in Solana Beach, California for the 8th Annual ElliptiGO Rally Weekend, held October 20-22. The 8th Annual Elliptical Cycling World Championships took place Saturday on Palomar Mountain. Rusty Snow won his unprecedented sixth title in a row, while newcomer Madeleine Marecki took the women's crown. More than 50 people gathered in Scottsdale, Ariz., for the 4th Annual ElliptiGO Winter Classic, which was the first event organized by the recently formed Global ElliptiGO Riders Club. Attendees represented 10 states and came from as far away as Florida, New Jersey and Massachusetts. The Classic featured group rides on Saturday and Sunday for riders of all levels. After the rides, attendees enjoyed a variety of activities, including sand volleyball, lounging poolside, dancing and socializing.